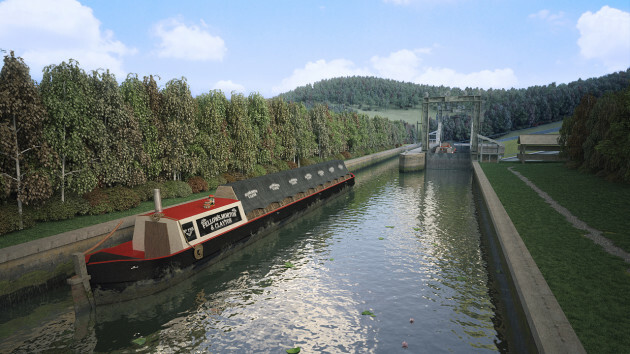 Lutterworth, UK — Visitors to Foxton Locks, Leicestershire, will once again be able to see the boats using the old Inclined Plane, albeit virtually, through the development of an Augmented Reality (AR) app. This innovative idea is part of a wider redevelopment of Foxton Locks and is designed to not only bring the Inclined Plane back to life, but also to engage, educate and inspire visitors of all ages with a new Museum experience integrated with the existing Foxton Locks Trail. When it goes live at Easter 2015, the project will create a new visitor experience at Foxton Canal Museum as well as boosting ticket revenues and visitor spend. Virtual reality specialist Holovis will be developing and delivering the AR app as well as a new curved screen theatre which will immerse visitors into history of the locks and an interactive experience for children and families, challenging them to simulate the stoking of the boiler to drive the massive boat lift. The project began on the Holovis Innovation Campus in nearby Lutterworth, where a 3D model of the Inclined Plane is being created in augmented reality. Using a fiducial marker system at Foxton Locks, visitors will be able to use their smart phones and tablets to view the Inclined Plane working, all in the exact position barges would have made their actual journeys and all in real time. The interpretation project is supported by the Arts Council Renaissance Strategic Support Fund. The successful bid to secure this funding was led by Leicester Shire Promotions with support from The Canal and River Trust, Foxton Inclined Plane Trust, Leicestershire County Council and Harborough District Council. Stuart Hetherington, CEO of Holovis explained: “We are delighted to be deploying our knowledge and expertise to preserve this fantastic piece of local history by bringing it back to life using the latest technology. Usually, we use virtual and augmented reality to help our commercial clients create sophisticated 3D design environments within the automotive, manufacturing, defence, and theme park industries. Saving them time, costs and labour, so creating the conditions whereby they only need to commit to building physical models or actual prototypes when they are certain about the final design. For more information on Foxton Locks and the Foxton Inclined Plane Trust, visit https://canalrivertrust.org.uk/places-to-visit/destination/1/foxton-locks and fipt.org.uk, respectively.